Explore the automotive industry’s latest creations at the Pennsylvania Convention Center during the 2019 Philadelphia Auto Show. The Philadelphia Auto Show features more than 700 concept, classic, luxury and exotic cars on display, with every major vehicle manufacturer represented. All vehicles are arranged by category, making it easy to navigate the 700,000-square-foot display floor. Visitors can get up-close and personal with the newest vehicle models that will soon be at dealerships around the region. Check out the latest green vehicles or explore exotic vehicles, both old and new. And here's the most important part - you DO NOT NEED A CAR to get to the Philadelphia Auto Show! Beginning Monday, 1/14, you can buy DISCOUNTED tickets to the Philadelphia Auto Show at all major SEPTA Transit Sales Offices and SEPTA Regional Rail Ticket Offices. Regular, adult admission price is $14. The SEPTA discounted price is $11. The discounted Auto Show admission tickets sold by SEPTA are valid for admittance to weekday shows only. Additional payment may be required on gate admittance on weekends. Seniors (62+) and kids (7-12) cost $7. Here's the most important part - you DO NOT NEED A CAR to get to the Philadelphia Auto Show! The Convention Center is a short walk from Jefferson Station, or you can ride the Market-Frankford Line to 11th or 13th, the Broad Street Line to City Hall or hop Routes 4, 16, 17, 23, 27, 33, 38, 44, 45, 48, 61, 78, 124 or 125. 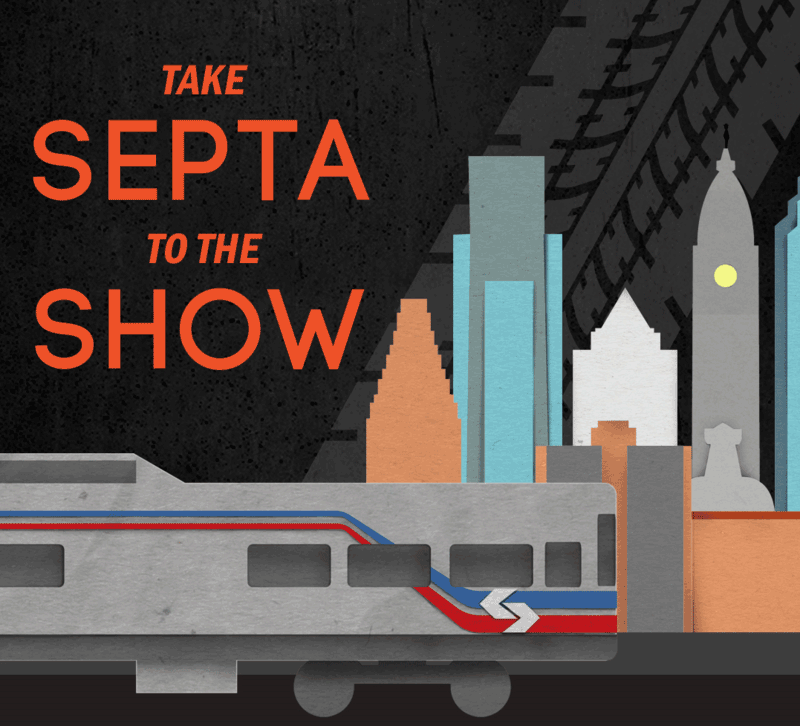 During the Auto Show, the One Day Independence Pass is valid on all SEPTA modes all day long. The One Day Independence Pass costs $13 per person. The $30 Family Independence Pass provides unlimited travel for one family of up to five people, traveling together on any one day (at least one person, but no more than two, must be 18 years of age or older). While additional fees apply on Regional Rail travel to and from Trenton and West Trenton, NJ, customers still save when purchasing Independence Passes over individual rail tickets. Please note, if you are heading home after the show from Jefferson or Suburban Station, you need to pre purchase your ticket in order to move through the turnstiles before proceeding to the train platform. Accepted fares include a SEPTA Key Card, SEPTA Key Senior Card/Current driver’s license with magnetic stripe (customers 65+ only), SEPTA Key Reduced Fare Card, February TrailPass, February TransPass (weekends only), SEPTA Regional Rail Ticket, and One Day Independence Pass. If you are heading home after the show from Jefferson or Suburban Station, you need to have a fare in order to move through the turnstiles before proceeding to the train platform. Accepted fares include a SEPTA Key Card, SEPTA Key Senior Card/Current driver’s license with magnetic stripe (customers 65+ only), SEPTA Key Reduced Fare Card, February TrailPass, February TransPass (weekends only), SEPTA Regional Rail Ticket, and One Day Independence Pass.